Every now and then, a product is released that is so simple yet so effective, you wonder how you ever lived without it. 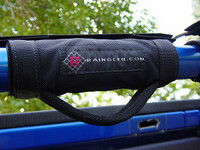 The Rollbar grab handles from Raingler are without doubt, one of those products. Installation is incredibly easy, you just decide where you want it and wrap the Velcro patches around the Rollbar. Couldn't be easier! Any doubts you may have about the capability of these "Velcro" handles to hold your weight are quickly dismissed as soon as you open the package. These grab handles have the largest single piece of Velcro I've ever seen! If you don't quite get the placement right the first time, you'll see just how strong that huge amount of Velcro really is. It takes a lot of effort to actually remove them! The material used making the handle itself is top quality and extremely strong. The same material is used in creating Bullet Proof vests. If the police forces will let their life depend on it, you can trust it to help you get in your 4x4! Where the Grab-Handles really shine is when you have the roof fitted to the Wrangler. With the roof off it's easy to grab the bar itself, but with the roof on you can't do that without risking trapping your fingers! With a Jeep vehicle, especially one with raised suspension and no side steps, the grab-handles make entry and exit so much easier. Infact, those with steps on standard height Wranglers may want to consider removing the steps for added clearance, and fitting the grab handles as an alternative. However, even when the roof is off, the grab handles are great! Quite simply, they're closer to you and much more comfortable to hold! One of the great things about the grips is the simplicity of their design. You have the freedom to mount them almost anywhere. 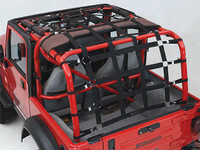 You can have them on the front rollbar, rear rollbar, center hoop, anywhere your passengers may require something to grab hold of when things get rough! Their use is not restricted to Jeep vehicles either. 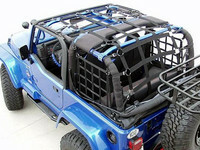 Any vehicle with an internal roll cage (Such as P.D.O. Spec Toyota LandCruisers) can use these grips. The Velcro attachment simply wraps around the bar itself. An interesting observation is how quickly people get used to them. With 4-inch raised suspension and large wheels on the Jeep, people often "look to the heavens" for help, and when they do - the Raingler grip is right there for them! The grips are a fantastic little product, and a simple addition that makes a world of difference. They are highly recommended! And for the price, you can't go wrong! 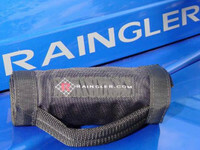 Raingler also offer a wide selection of other products, such as a full netting system to keep objects and loved ones from falling out when things get bouncy, and a selection of Jeeperman bumpers, skidplates, racks, off road lights and more. If the quality of these grips are anything to go by, the rest of his products will be very impressive! The pictures in this review come from the Raingler website. Unfortunately we don't have pictures of the grips on our Jeep just yet, but we will do soon! Eddie who owns Raingler has a stunning Intense Blue Wrangler that you see a little bit of in the pictures!